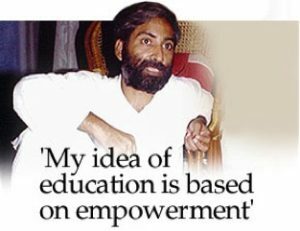 In 1995, Sandeep Pandey quit his job at the Indian Institute of Technology-Kanpur, and plunged into working for Asha — an education program for underprivileged children. His years of dedication brought him the Ramon Magsaysay Award— the Asian equivalent of the Nobel Prize. At 37, he was the youngest Indian to have been conferred with the award. The award committee’s citation, drawing parallels between Pandey and Gandhi himself, ends with these words – “the board of trustees recognizes the empowering example of his commitment to the transformation of India’s marginalized poor.” It was in the summer of 1991 that Pandey, along with two other friends, founded Asha for Education during his student days at the University of California, Berkeley. Today, the organization has 35 chapters in India, USA and several other countries. Sandeep Pandey devotes his energies entirely to his activist causes, including communal harmony. At the Asha ashram near Lucknow, he has created a learning environment where students live and study among working communities of artisans and learn trades in addition to their R’s. The ashram works to overcome caste barriers that dalits face, publicizes official corruption in the local areas, and develops appropriate technologies for the rural region. ICA helped Sandeep start Asha, and has helped support many of his numerous endeavors in India, including India Pakistan Peace March.